The first decade of the 21st Century has been disastrous for financial institutions, derivatives and risk management. Counterparty credit risk has become the key element of financial risk management, highlighted by the bankruptcy of the investment bank Lehman Brothers and failure of other high profile institutions such as Bear Sterns, AIG, Fannie Mae and Freddie Mac. The sudden realisation of extensive counterparty risks has severely compromised the health of global financial markets. Counterparty risk is now a key problem for all financial institutions. 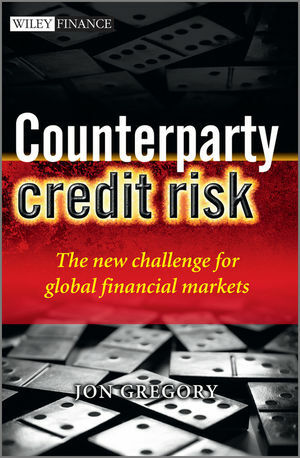 This book explains the emergence of counterparty risk during the recent credit crisis. The quantification of firm-wide credit exposure for trading desks and businesses is discussed alongside risk mitigation methods such as netting and collateral management (margining). Banks and other financial institutions have been recently developing their capabilities for pricing counterparty risk and these elements are considered in detail via a characterisation of credit value adjustment (CVA). The implications of an institution valuing their own default via debt value adjustment (DVA) are also considered at length. Hedging aspects, together with the associated instruments such as credit defaults swaps (CDSs) and contingent CDS (CCDS) are described in full. A key feature of the credit crisis has been the realisation of wrong-way risks illustrated by the failure of monoline insurance companies. Wrong-way counterparty risks are addressed in detail in relation to interest rate, foreign exchange, commodity and, in particular, credit derivative products. Portfolio counterparty risk is covered, together with the regulatory aspects as defined by the Basel II capital requirements. The management of counterparty risk within an institution is also discussed in detail. Finally, the design and benefits of central clearing, a recent development to attempt to control the rapid growth of counterparty risk, is considered. This book is unique in being practically focused but also covering the more technical aspects. It is an invaluable complete reference guide for any market practitioner with any responsibility or interest within the area of counterparty credit risk. Dr Jon Gregory is a consultant specialising in the area of counterparty risk. He started his career at Salomon Brothers (now Citigroup). From 1997 to 2005, he worked for BNP Paribas, initially developing the framework for the pricing and management of counterparty risk for the fixed income division and later being part of the rapid growth of the credit derivatives business. From 2005 to 2008, he was Global Head of Credit Analytics at Barclays Capital based in London. He has published many papers in the area of credit risk, recently looking at some of the complex counterparty risk issues in relation to the credit crisis. In 2001, he was co-author of the book Credit: The Complete Guide to Pricing, Hedging and Risk Management, short-listed for the Kulp-Wright Book Award for the most significant text in the field of risk management and insurance. 1.2 The failure of models. 1.5 Counterparty risk in context. 2 Defining Counterparty Credit Risk. 2.3 Controlling counterparty credit risk. 2.5 Metrics for credit exposure. Appendix 2.A Characterising exposure for a normal distribution. 3 Mitigating Counterparty Credit Risk. 3.3 Termination and walkaway features. 3.7 The mechanics of collateralisation. 3.8 Is risk mitigation always a good thing? Appendix 3.A EE of independent normal variables. 4 Quantifying Counterparty Credit Exposure, I. 4.3 Models for credit exposure. Appendix 4.A Semi-analytical formula for exposure of a forward contract. Appendix 4.B Computing marginal EE. 5 Quantifying Counterparty Credit Exposure, II: The Impact of Collateral. 5.2 The impact of collateral on credit exposure. 5.5 The risks of collateralisation. Appendix 5.A Calculation of collateralised PFE (cash collateral). Appendix 5.B Calculation of collateralised netted exposure with collateral value uncertainty. Appendix 5.C Mathematical treatment of a collateralised exposure. 6 Overview of Credit Risk and Credit Derivatives. 6.1 Defaults, recovery rates, credit spreads and credit derivatives. Appendix 6.A Defining survival and default probabilities. Appendix 6.B Pricing formulas for CDSs and risky bonds. Appendix 6.C Pricing of index tranches. 7 Pricing Counterparty Credit Risk, I. 7.2 Pricing new trades using CVA. Appendix 7.A Deriving the equation for credit value adjustment (CVA). Appendix 7.B Approximation to the CVA formula in the case of no wrong-way risk. Appendix 7.C Approximation linking CVA formula to credit spread. Appendix 7.D Specific approximations to the CVA formula for individual instruments. Appendix 7.E Calculation of CVA increase in the presence of netting. Appendix 7.F Deriving the equation for bilateral credit value adjustment (BCVA). Appendix 7.G Approximation linking CVA formula to credit spreads for bilateral CVA. Appendix 7.H Deriving the equation for BCVA under the assumption of a bilateral walkaway clause. 8 Pricing Counterparty Credit Risk, II: Wrong-way Risk. 8.4 Counterparty risk in CDSs. 8.5 Counterparty risk in structured credit. 8.6 Counterparty risk and gap risk. Appendix 8.A Computing the EE of a typical forward exposure with correlation to a time of default. Appendix 8.B Formula for a risky option. Appendix 8.C Formula for pricing a CDS contract with counterparty risk. Appendix 8.D Pricing of a leveraged super senior tranche. 9.3 Hedging a risky derivative position. 9.4 Traditional hedging of bonds, loans and repos. 9.5 Risk-neutral or real parameters? Appendix 9.A Example of calculation of CVA Greeks. 10 Portfolio Models and Economic Capital. 10.4 The impact of stochastic exposure. 10.5 Special cases of alpha. 10.6 Credit migration and mark-to-market. Appendix 10.A Credit portfolio model. Appendix 10.B Simple treatment of wrong-way risk. 11 Counterparty Risk, Regulation and Basel II. 11.2 The birth of Basel II. 11.3 Basel II Framework for fixed exposures. 11.4 Exposure at default and Basel II. 11.5 Basel II internal model method. 11.6 Basel II and double-default. Appendix 11.A Effective remaining maturity. Appendix 11.B The asset correlation and maturity adjustment formulas in the advanced IRB approach of Basel II. Appendix 11.C Netting and collateral treatment under the current exposure method (CEM) of Basel II. Appendix 11.D Definition of effective EPE. Appendix 11.E Double-default treatment of hedged exposures in Basel II. 12 Managing Counterparty Risk in a Financial Institution. 12.2 Counterparty risk in financial institutions. 12.3 Insurance company or trading desk? 12.4 How to calculate credit charges. 12.5 How to charge for counterparty risk. 13 Counterparty Risk of Default-remote Entities. 13.2 The value of monolines and CDPCs. Appendix 13.A Simple model for a credit insurer. Appendix 13.B The valuation of credit insurer purchased protection. 14 The Role of a Central Counterparty. 14.2 The viability of centralised clearing. 15 The Future of Counterparty Risk. 15.1 A counterparty risk revolution? 15.5 Credit value adjustment (CVA).